On Saturday 17 March, on the Greek island of Lesvos, 300 people gathered in Mytilene’s main Sappho Square to mark the second anniversary of the EU-Turkey deal (described as a ‘statement’ to avoid the scrunity of the European parliament). The deal is credited with leaving thousands of refugees either stranded in Turkey or attempting to take more dangerous routes to reach Europe. According to Lesvos Solidarity, it ‘has turned Lesvos, and other islands in the Aegean, into prison islands’. Those detained there have no guarantee of a full and fair asylum procedure, and ‘as a direct result of the despair inflicted by the EU – Turkey statement, suicide attempts have become a daily reality in the Greek islands’. Overcrowding in Lesvos’s Moria detention centre has led to increasing tension, putting lives at risk. The 17 March demonstration was a show of solidarity with those detained in Moria, for whom violent police raids are becoming a regular reality. It was also a cry of warning against the growing difficulties refugees now face in resisting the limbo into which they are forced. Efi Latsoudi, a founding member of Lesvos Solidarity, states that on the first anniversary of the EU-Turkey deal ‘we marched in Mytilini with over 1500 people, together with the refugee communities. Some refugees who were in that march are still trapped here, they are still waiting. Many are at risk of being deported to Turkey or their home country, where they are not safe.’ For those remaining on the island, the capacity to resist detention has been much reduced. 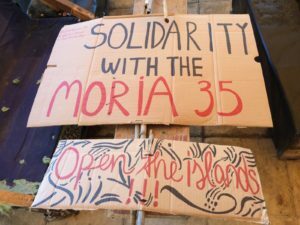 Activists drew attention to the case of the Moria 35, whose legal battle demonstrates the increasingly heavy hand dealt to refugee protesters by police and courts. In the week after the arrests, police again entered Moria, notifying many African residents that their appeals had been rejected and deporting them to Turkey. A pregnant woman who had been beaten was transferred to Athens. These measures, according to the Moria 35, were an attempt ‘to get rid of any witnesses to the police’s attack against us’. Thirty of the accused were placed in pre-trial detention, imprisoned in Chios, Athens, Attica and Central Greece. Musaferat, an anti-racist collective against deportations based in Lesvos, states that this dispersal posed ‘significant obstacles to their preparation for the upcoming trial’. The trial is set to take place on 20 April 2018 on the neighbouring Aegean island of Chios. 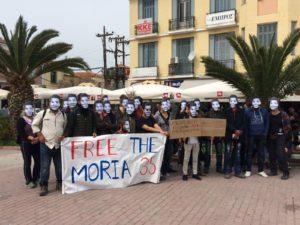 Supporters of the 35 have warned that the decision not to hold the trial in Mytilene limits the ability of defence witnesses, many of whom ‘are migrants put under administrative restrictions, who do not have the option to leave Lesvos’. Lorraine Leete of the Legal Centre Lesbos spoke on the second anniversary of the EU-Turkey deal of the restrictions on protest enacted by the pervasive threat of legal proceedings against the island’s refugee community. ‘This year we are fewer because there’s been a co-ordinated effort to crush resistance by migrants in Moria.’ She stated that the court’s actions against the Moria 35 were ‘an effort to collectively punish a community that had been organising for months inside Moria … people are afraid to come out and stand up for their rights’. The threat of deportation for those refugees living on the island contributes to the increasing difficulties refugees face in resisting their limbo state. Having had their asylum claim rejected for a second time, many refugees face arrest and deportation. Claims of police violence and denial of medical care for those detained are widespread. Facing a justice system in which 99 per cent of appeals are rejected, many refugees have little choice but to go underground. The Lesvos Christian Peacemaker Team, which monitors human rights abuses in militarised areas, reports that a growing number of refugees live in hiding in Mytilene, sleeping in forests or abandoned buildings. The Legal Centre Lesbos warns that the criminal charges against the Moria 35 carry disproportionately heavy sentences of up to ten years in jail. The centre is helping to coordinate the legal defence, and has filed complaints of police violence that are now under investigation. To contribute to the legal defence fund, click here.